Posted Sep 29, 2018 by Eds. Brazilian presidential candidate Fernando Haddad took part in a press conference in São Paulo on Monday and addressed the rise of movements against far-right candidate Jair Bolsonaro, who has been in the lead in opinion polls since ex-president Luiz Inácio Lula da Silva was barred from running for office. Haddad, a former minister of Education, said Brazil is facing “a threat of contemporary forms of dictatorship,” even though no clear consensus exists among the economic elite regarding an endorsement for Bolsonaro. All kinds of demonstrations will be staged by those who are committed to democracy. The ruling class is not unified. A lot of people are feeling embarrassed about what is happening. The Workers’ Party candidate said he is not only concerned about the election race, but about whether the results will be respected. The first round will take place on Oct. 7 and a runoff election may take place on Oct. 28 in case no candidates receive more than 50 percent of the vote. As an example of antidemocratic practices, the left-wing candidate looked back at the backlash from Dilma Rousseff’s Opposition after she was reelected president. In 2014, they created a ‘three-round’ election. It’s not obvious that whoever gets elected will be able to rule. A historical crossroad. This is how Haddad sees the October elections in the country. On the one hand, he says preserving the legacy from the Workers’ Party administrations [2003-2016] is necessary, especially from the Luiz Inácio Lula da Silva administrations [2003-2010]. On the other hand, conservative forces are willing to take advantage of the economic crisis to compromise social policies. “Why did I defend Lula’s right to run until the last possible minute? Because there is huge symbolism to it,” he said. “We’re talking about the CLT [Consolidation of Labor Laws], the SUS [Unified Health System], public, free, secular universities, recognizing women and black people, all this was made possible through great struggle. Maybe this crisis is necessary for us to really grasp what we had during the Lula administration, what we have lost, and what we may have again,” he added. To put Brazil back on track to guarantee more rights and democracy, Haddad said he hopes he can count on Workers’ Party supporters, but not only them. 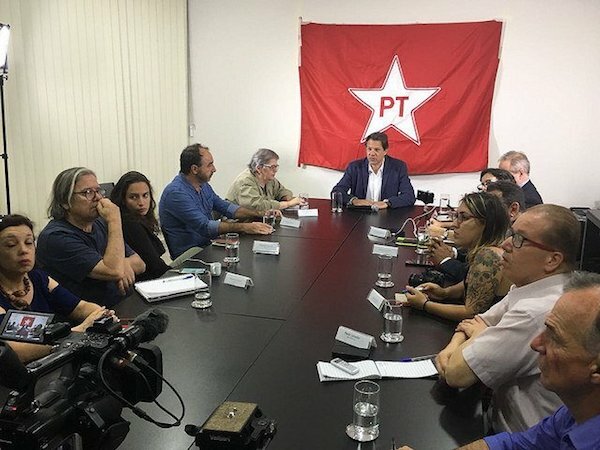 “Part of society is not with us, but is willing to discuss the paths of the country in 2019,” he argued, commending the groups who are mobilizing in the country and abroad to denounce Jair Bolsonaro’s authoritarian ways. Protests called by women are being endorsed by many different segments of society will take to the streets across the country next Saturday.